Today we are celebrating the completion of 5th grade! Amber finished everything except math last week and has been working through the last three math lessons this week. She just took the last test, officially completing the school year. We are so proud of Amber's accomplishments this year, especially the last few months when she has been so ill. We could not be more pleased with the results of our homeschooling year, nor with the love of learning Amber has shown recently. Final report card of 5th grade! Amber has been feeling remarkably better this last week, and although we don't understand exactly why, we are very thankful. By last Thursday when she did the colonoscopy prep we were getting desperate. Amber looked pale, had deep, dark rings around her eyes, was constantly nauseated, and scared. After starting the laxatives for the prep she honestly felt better than she had in weeks. Friday morning before her colonoscopy she was chipper, happy, did not have any nausea, and was even looking a little better. This was a very telling reaction. Clearly something inside her intestines had been causing a problem. Top-L: Very sick little girl. This wasn't even the worst of it. Top-R: Colonoscopy prep. A fairly good day. Bottom-L: Right before the procedures. Playing Fruit Ninja on Daddy's phone. Bottom-R: Dancing and leaping 4 days after colonoscopy. 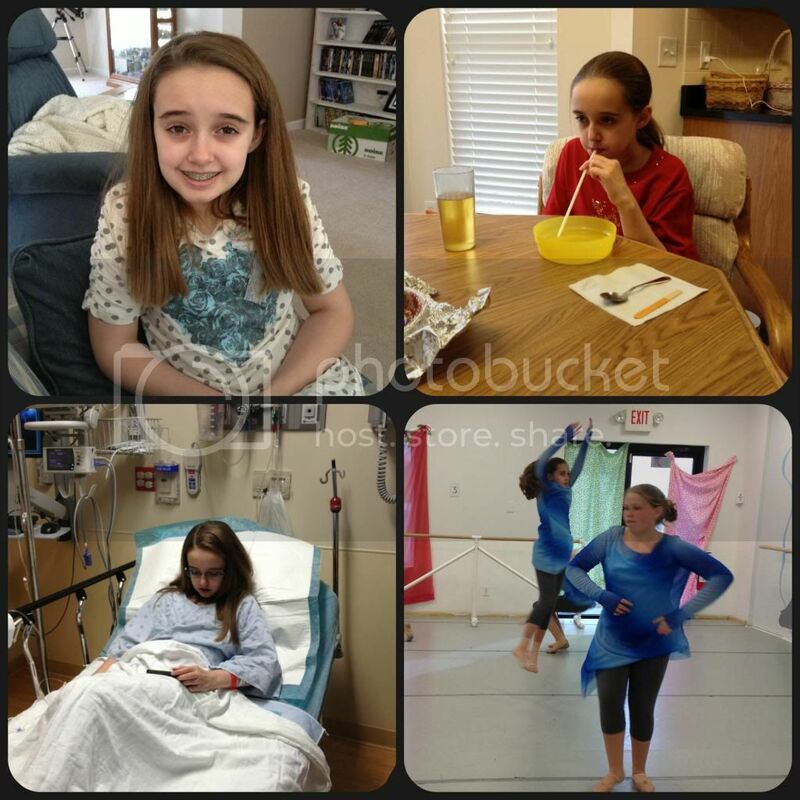 We received the results of Amber's biopsies yesterday, which showed she had duodenitis at the time of the tests. Thankfully, we started a gluten free diet for both Amber and me last Friday after her tests. Both of our GI doctors are supportive of this choice, but Amber's doctor has gone further since the biopsy results came in. She made the gluten-free diet a formal portion of Amber's treatment, while also ordering additional tests to determine the cause of the inflammation, and a new medication to heal it. Now we are the not-so-normal homeschooling people who have to special order at restaurants. We're fun! Even though there has only been math left in school, we have been crazy busy this last week. 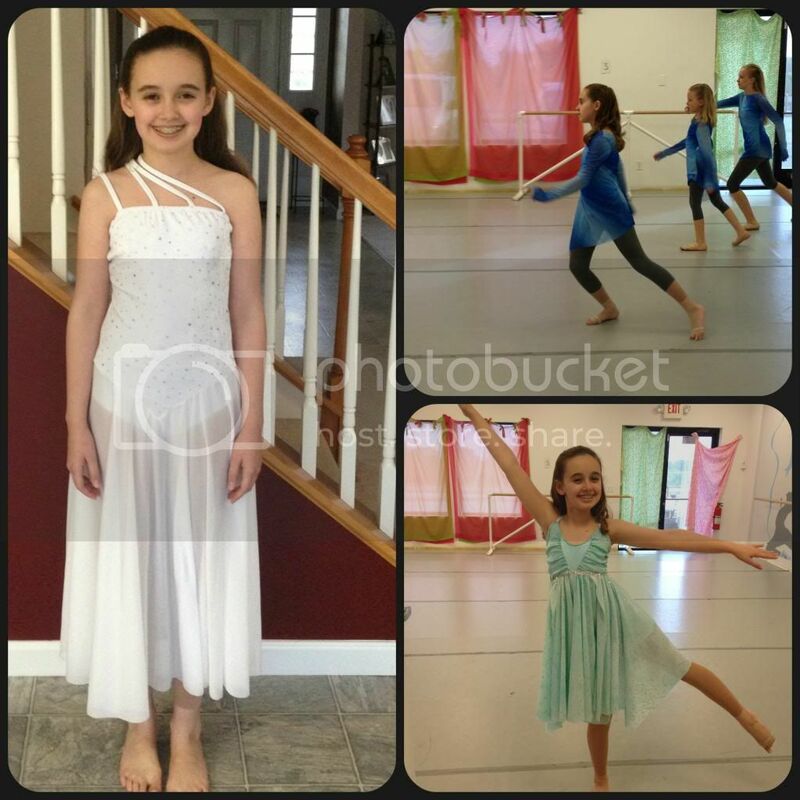 This was dress rehearsal week for dance, and thankfully Amber was able to attend since the previous week she managed only 1.5 of her 6 classes. She's still not back to full strength yet, but she had fun dancing and attended all her classes. Dance recital isn't for another week, but musical theater and piano recital are tomorrow. White: Lyrical costume. Oddly, it is identical to the ballet costume, except ballet is pink. Dark Blue: Contemporary. This was her first semester dancing contemporary and she loved it! Teal: Lyrical Solo. This costume is nearly identical to her lyrical competition costume from 3 years ago. Same material, slightly different dress design. The sale of our other house looks to be a definite now! The inspections are completed, agreements on inspection items finalized, and the majority of the work is even finished. Amber has patiently spent a portion of nearly each day for the past week at the old house while one or both of her parents worked on repairs. This has been a physically and emotionally draining situation which should be resolved in mid-June. It can't be soon enough for all of us. In our little free time, Amber and I have been cleaning our pantry, freezers, and refrigerators of all the glutenous foods, excepting the few things Fred will eat. We also have made almost daily shopping trips to the local grocery store's gluten free aisle (thanks Dierberg's), as well as numerous excursions to Target for new kitchen gadgets. Most of my cooking utensils have to be replaced for gluten free cooking. Thankfully, my birthday was last week, so I received a lot of fun new cooking toys and managed to purchase a couple of bigger toys myself as part of a birthday present. Our first batch of gluten-free chocolate chip cookies. The texture is different, but they were still yummy! Right now Amber and I are very fond of the recipes at Gluten Free on a Shoestring. We've found other wonderful resources for gluten free cooking too, but unfortunately many do not match our tastes. So many of them are what we call "fru-fru" food. It looks pretty, sounds trendy, and we'd never eat it. 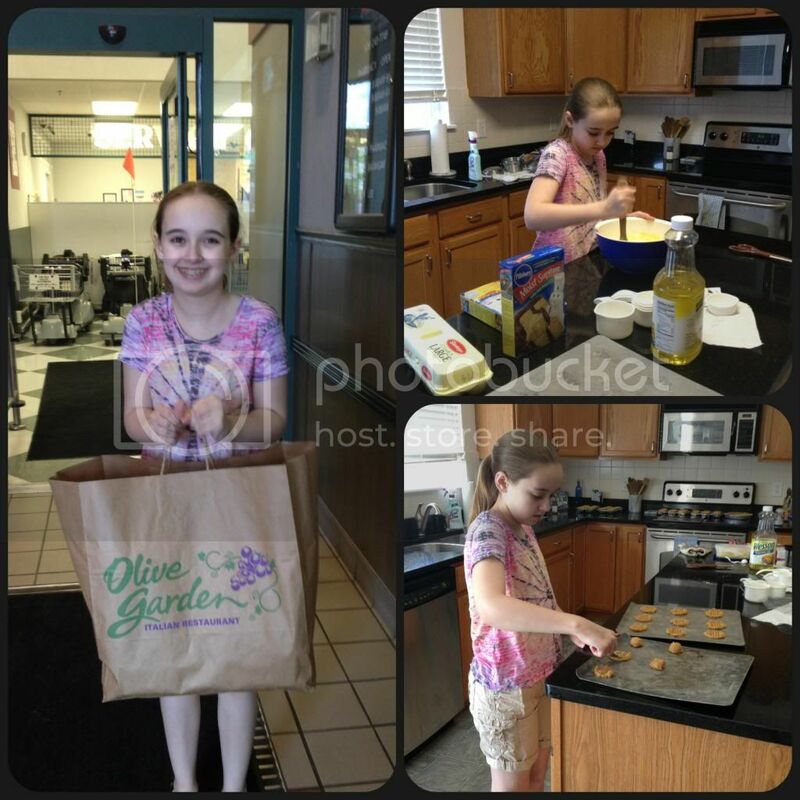 Nicole at Gluten Free on a Shoestring has just the right mix of everyday food items, copy-cat recipes, and breads. Oh the breads! Yesterday, Amber and I did spend the whole day making gluten filled baked items to donate to Heartland Humane Society's bake sale this weekend. Our beloved Biscotti (kitty) was adopted through Heartland and we love to support them when we can. We had tons of gluten baking mixes that needed to leave our house, so we decided to bake them all in one day for the bake sale this weekend. It was a long afternoon, however it was also very rewarding to know we are helping Heartland pay vet bills and provide services for more homeless animals. Baking for Heartland and delivery the goodies at the drop-off location. Now that we have completed our first full year of homeschooling, we are more certain than ever that this is the path for our family. Yes, Amber clearly thrived after the unexpected and abrupt change during fourth grade, but this year was the real test. After the honeymoon period of the initial semester wore off would we still be as enamored with homeschooling? The answer is a resounding yes! There have been the obvious benefits when family members are sick for prolonged periods, and the ability to deal with other personal issues. However, the real answer for us is Amber's attitude toward school, her general state of mind, and how much she has learned in just one year. We love being able to tailor the lessons to her learning style, to set our own schedule, and to always encourage Amber in her learning. Amber will be continuing this summer with relaxed Biology and Latin, but otherwise this is the last of our formal school lessons until August! I am glad to her that Amber is feeling better and you are starting to get some answers. Praying the root cause can be found soon. I like the 'Fru Fru' food concept. I see so many pretty recipes on Pinterest and go 'They will never eat that' Some times I can take the concept and change the flavors around to match my family. I'm so glad Amber is feeling better. 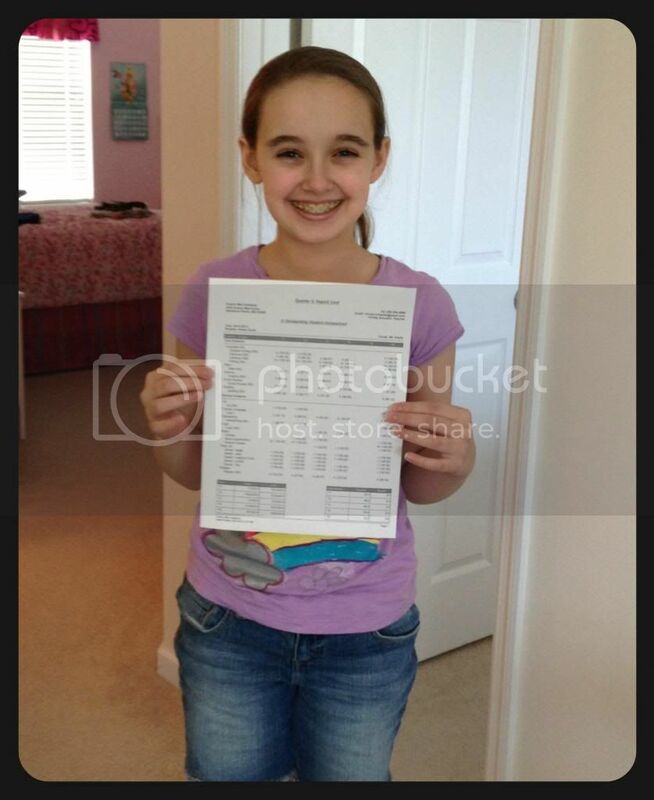 She looks so proud and happy of her academic accomplishments and looks so beautiful in her lovely costumes! 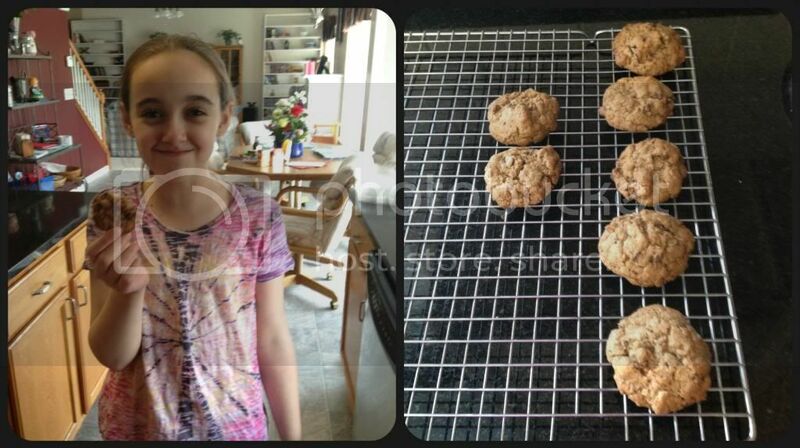 I'm glad you're having fun and liking your gluten free goodies too! Happy late Birthday and thanks for sharing at FF! Congrats on the end of your year! I love Amber's dance costumes -- they are so pretty! Have you seen the blog Lynn's Kitchen Adventures? (http://www.lynnskitchenadventures.com/) She has a big gluten free section with lots of baking recipes. I make a lot of her breakfast recipes (not necessarily the gluten free ones, though some happen to be). Her baked oatmeal varieties are all very tasty...I wish my kids liked it as much as I do! So happy she got some relief! Seems like you are heading in the right direction! Glad she was able to finish school!